Condor Elite Sector Sling Bag Covert Urban Combat/Tactical Pack Tactical Armor Plate Carrier! (Video!) | DefenseReview.com (DR): An online tactical technology and military defense technology magazine with particular focus on the latest and greatest tactical firearms news (tactical gun news), tactical gear news and tactical shooting news. 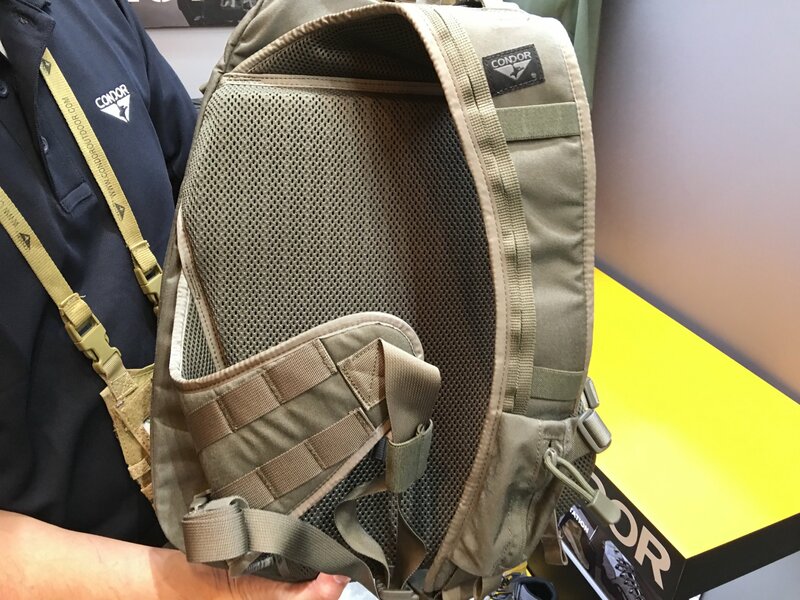 And, while we’re on the subject of brand new Condor Elite packs at SHOT Show 2016, we should also mention that Chris Dunn of Condor Outdoor Products also showed DefenseReview (DR) the new Condor Elite Sector Sling Bag, which would appear to be an even lower-profile/lower-visibility design for urban combat/tactical missions than the similar Condor Elite Agent Covert Sling Pack, as it does away with the latter’s laser-cut MOLLE/PALS webbing attachment system on the outside of the bag. Just like the Condor Elite Fail Safe Pack lo-pro/lo-vis (low-profile/low-visibility) covert urban assault pack (backpack) , the Sector Sling Bag offers a minimalist, streamlined design, with multiple zippered compartments and inner pockets/pouches for organizing your stuff, as well as comfortable ventilated padding. The bag feature’s an innovative design, particularly with respect to the rear concealed carry (CCW) hidden compartment that allows the access his/her pistol from the hook-and-loop Velcro compartment from the top or bottom, depending on how you want to mount the pistol holster. This is a really nice feature. The pack even features a built-in/integrated weapon sling (tactical rifle sling) that tucks away until needed. The kicker is that since the Sector Sling Bag’s one-strap-carry aspect allows the bag to be very quickly moved to the wearer’s front, so the blag blocks the wearer’s chest/torso, the bag can also double as an expedient, makeshift tactical armor plate carrier of sorts in a pinch, if the wearer comes under (rifle) fire. 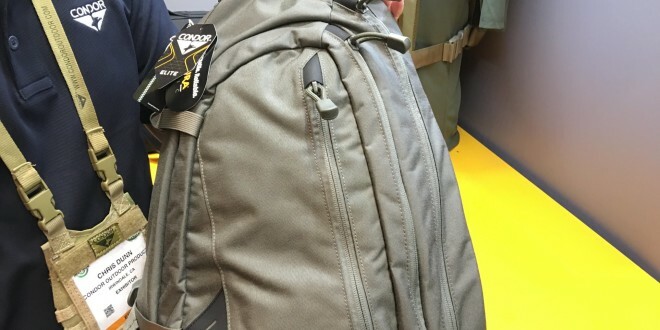 The Sector Sling Bag appears to be ideally-sized to hold a SAPI/ESAPI ceramic hard armor plate in the back of it, placing the plate directly next to the chest when the bag is swung around. This is one neat little bag. 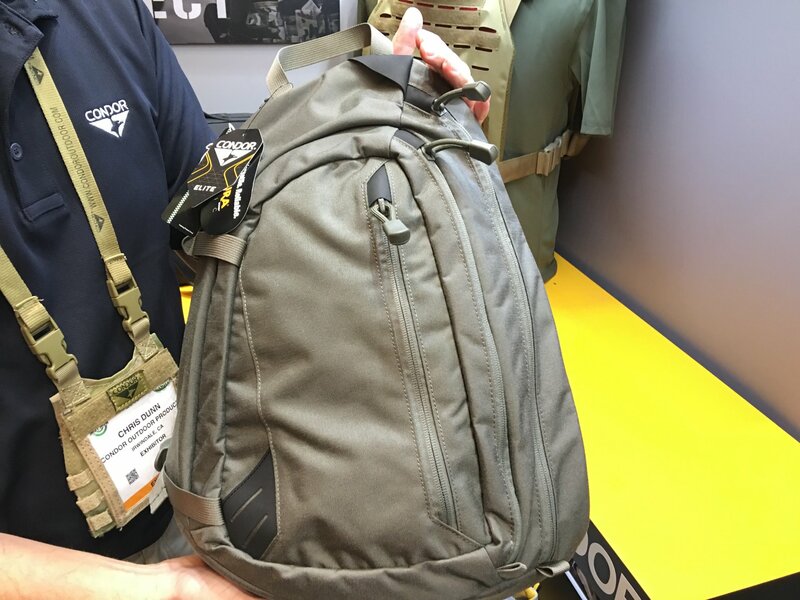 As of SHOT Show 2016, the Condor Elite Sector Sling Bag’s MSRP was approx. $90.00 USD, according to Dunn. Condor STRYKE (Single-Point/Two-Point) and COBRA (Single-Point) Bungee Tactical Slings for Your Tactical Rifle/Carbine/SBR: Now in A-TACS and MultiCam Camo Patterns! Camelbak Ambush AB 500, Thermobak AB, and Linchpin Tactical Hydration Packs/Reservoirs with Direct Armor Attachment System (D.A.A.S. ): Strap your tactical hydration directly to your tactical armor plate carrier/tactical vest system!